Tryptophan is transported into brain by a competitive carrier system it shares with such other large neutral amino acids as tyrosine, phenylalanine, leucine, isoleucine, and valine. Physiologic variations in the plasma neutral amino acid pattern (either as a change in plasma tryptophan, or in the plasma concentration of one or more of its competitors) directly alter this competitive process, and thereby modify the uptake of tryptophan into brain. Such variations in tryptophan uptake influence brain tryptophan levels, and thus serotonin synthesis. Food intake, by influencing directly the plasma levels of large neutral amino acids, can therefore predictably modify brain tryptophan uptake and serotonin synthesis. The effect of food intake on the competitive uptake of tryptophan into brain, and on brain tryptophan levels, has recently been shown not to be limited to this amino acid, but also holds for other large neutral amino acids, and for certain large neutral amino acid drugs (e.g., methyldopa). Hence, following a meal, the brain concentration of any large neutral amino acid appears to depend on how the food modifies the plasma level of that amino acid relative to the plasma concentrations of its competitors. The binding of tryptophan to albumin in blood has also been suggested to influence brain tryptophan uptake. However, this notion has not been sustained by the results of nutritional studies, in which meal-induced changes in brain tryptophan levels were readily shown not to be predicted by the alterations in the size of the serum free tryptophan pool. 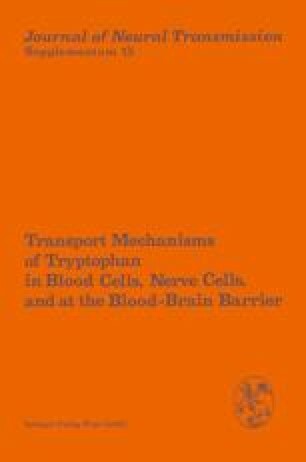 Taken together, these data affirm the importance of competitive transport in determining brain tryptophan uptake and levels, but question whether serum albumin binding and the size of the free tryptophan pool function physiologically to modulate brain tryptophan concentrations.